I'm a big fan of oyster getaways. Especially those that are easy to take from NYC. A couple weeks ago, my friend Ryan and I decided to take the Hampton Jitney out to the North Fork of Long Island for an oyster-filled day trip, not too unlike the one I did with NY Oyster Lovers in 2011. So in celebration of National Oyster Day, here's a photo recap of our little jaunt! When ownership of this Bait & Tackle shop was up for grabs, Ian Wilde from Little Creek Oyster Farm saw a unique opportunity. This little shack began life as the wheelhouse of a great whaling ship, but was later cut off and brought ashore in 1880. 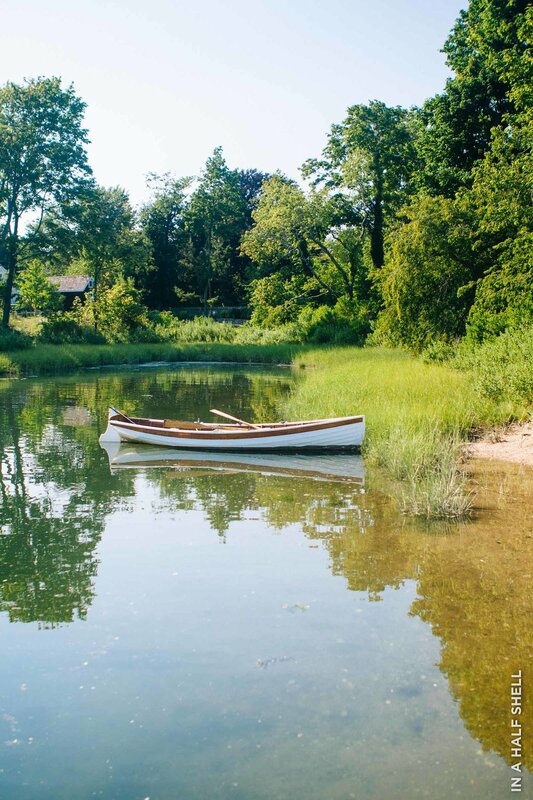 Since then, it has witnessed many ebbs and flows of Greenport's harbor community. The inside of the shop is pleasantly airy and bright. Charming, whimsical oyster tools and trinkets are scattered about the room. Ian decided to retain bits of the shop's fishing heritage by reserving one wall to just that. Not exactly sure what that noose is for though... I'm sure it's a boating thing? 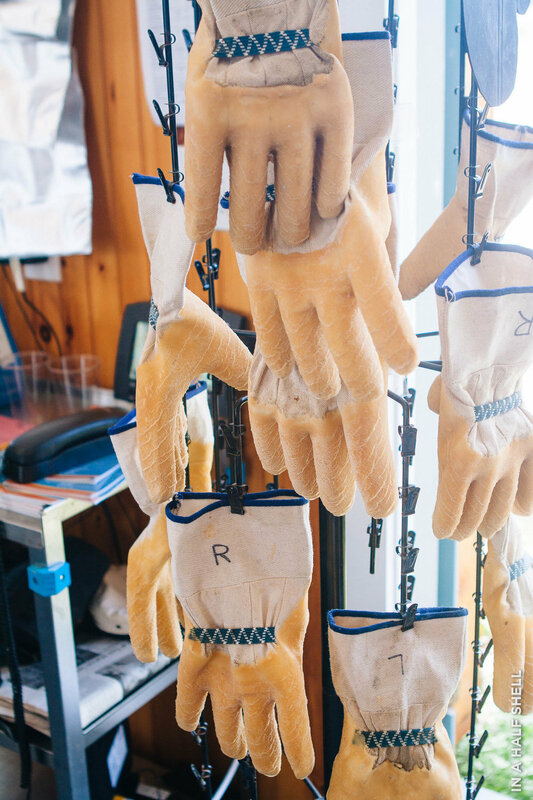 A row of pre-assembled oyster shucking kits and tree of sturdy rubber gloves wait patiently for their next users. Ian showing us an impeccable local oyster from Orient Point. Ryan ready to shuck! B&T is also a place where you can test out a variety of oyster knives. From Boston-style to New Haven-style, there was a blade for every kind of shucker. I gravitated to the pointier, stubbier blade from Murphy (shown above in green), which was identical to the Sewansecott knife. This was Ryan's first time shucking! She was a natural. 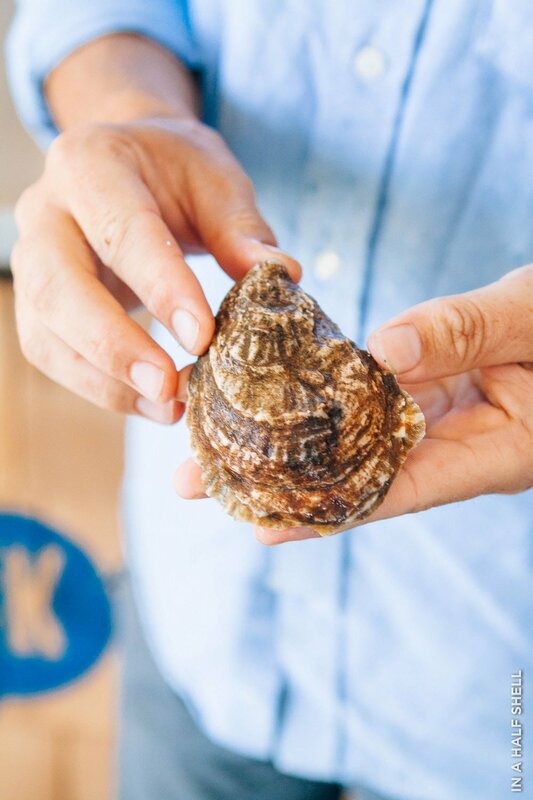 If you want to learn how to shuck, check out this handy collection of shucking videos on YouTube that I curated, or if you want a more comprehensive, insider's scoop on oyster shucking/storing/buying, sign up for my Oyster Mastery class on Skillshare! Reaping the rewards of one's handiwork is one of the greatest feelings on the planet. #2 Beer Tasting at Greenport Harbor Brewing Co. Enter the Greenport Harbor Brewing Co. on the side facing the Greenport Jail. Go up the stairs to the tasting room. Ry and I both ordered a tasting ($8) each, but in hindsight, I think we could've done just fine sharing a tasting between the two of us. The tasting goes in the order that's listed on the blackboard, but you have the option to skip around. The cute tasting glasses are yours to keep. I am OBSESSED with their whale tail logo. We ran into the cutest little pug ever—Bagel! He was huffing and puffing for several minutes after climbing a flight of stairs. Still looks happy though! We had a great time hanging out with David Berson, the owner and operator of The Glory, a unique solar-powered vessel. Dave is hilarious and his tour of Greenport Harbor is a fun little outing for all. We got a glimpse of some oyster farms from the beautifully calm water, including Widow's Hole (read on for more) and Pipes Cove. Dave's boat is a beauty and it runs like a dream—literally! It makes almost no noise at all thanks to the electric motor. If you play your cards right, he might even let you steer for awhile. Finally, we walked over to Mike and Isabel Osinski's place, home to Widow's Hole Oyster Farm, which is just a few blocks away from the town center. Isabel was kind enough to show us around their gorgeous property and oyster farm, including a snazzy new oyster nursery. 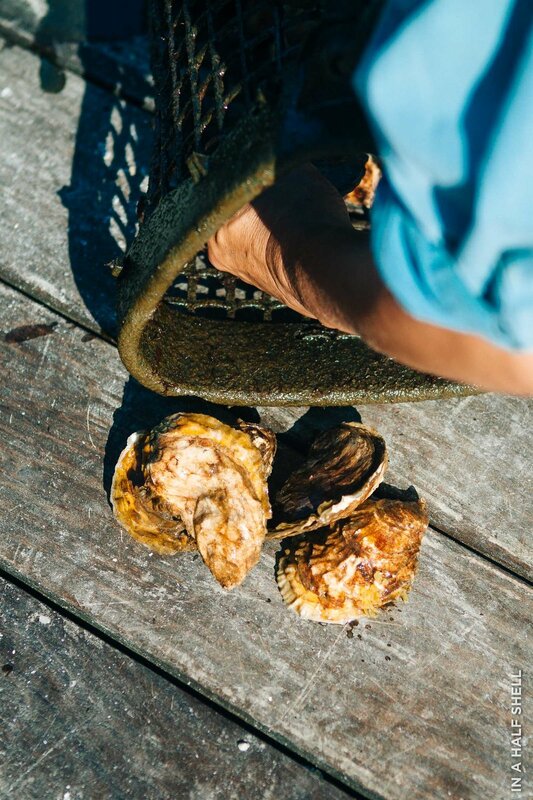 Bags of market size oysters were laid out in the summer sun to be "cured" of biofouling. This was just one day's batch! We tried a couple Widow's Hole oysters in the kitchen. Despite a few being spawny right now, they were quite delicious. Medium brininess with hints of mushroom and almond, and a creamy finish. I don't know why some folks dismiss spawny oysters. I think they taste just fine. They almost take on a texture similar to that of a Pacific gigas oyster. Getting there: driving from Midtown, Manhattan to Greenport takes anywhere from 2.5 - 3 hours, depending on traffic. The Hampton Jitney is an easy and affordable way to go. One way is $19 if you pre-book tickets online. Making a plan: check out this handy website about Greenport for activity/restaurant/lodging ideas! Oyster tour: if you're interested in going on a similar oyster-filled adventure, I'd love to help you plan a trip that is tailored to you. Email me with number of people, ideal travel date/s, and your experience level with oysters.